Wednesday, December 7, noon7:00 p.m.
Thursday, December 8, 10:00 a.m.2:00 p.m.
See demonstrations of innovative products and services that can optimize your systems, network, and Internet managementand simplify your life. Make knowledgeable decisions regarding products and services for your business needs. 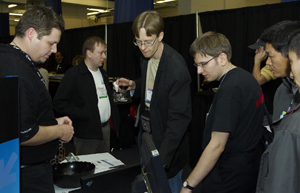 Exhibitor demonstrations save you hours of research and let you quickly compare solutions. All training program and technical sessions attendees receive admission to the exhibition as part of their registration. Want to attend only the exhibition? 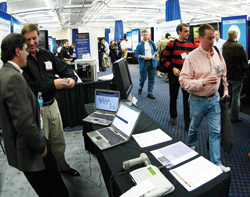 Register now for your free pass to the LISA '11 Vendor Exhibition. Simply select the FREE Vendor Exhibition Only Pass in the Conference Passes section of the registration form. Exhibitors, please use the regular registration form to register. Simply select Exhibitor Pass in the Conference Passes section of the registration form and then continue through the form sequence. Have more than one person working in your booth? When you reach the�Group Registration page, you may add additional folks from your organization to register them at the same time. Join us at the Vendor Exhibition for tasty beverages and take the opportunity to learn about the latest products and technologies. Interested in exhibiting at or sponsoring LISA '11?